Outside the circle of people who develop games, a game “Jam” event isn’t really a well-understood phenomenon. When I told friends I was going to be participating in a weekend-long game event, their assumption, perhaps a natural one, was that I was going to be spending an entire weekend playing games. These sort of marathons have become more common. Often they’re done for entertainment; other times, to raise money for charity. I think overall, a weekend of playing games is more easily comprehended than the strange animal that is a game jam: a one-weekend development event. So in case you didn’t already know, Global Game Jam is actually about taking 48 hours to make a game. The games can be made solo, but are typically made in small teams. It is not the only event of its kind: Ludum Dare is a 48-hour competition for developers which allows only solo entries, and lots of universities and conventions may hold jam events and competitions locally. Global Game Jam, however, is the largest event of its kind and attracts participants from all over the world. This year, according to the Jam website, there were 244 jam sites in 48 different countries. 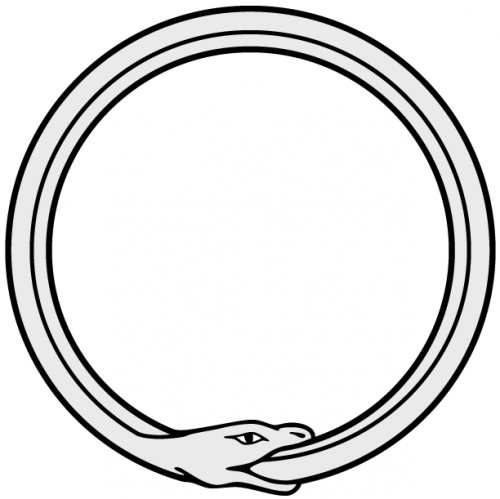 That is, a picture of the Ouroboros. Some games, including one at our site, utilized the picture directly as a graphic or gameplay element. Other jammers looked up its symbolic properties, and made games focused on the idea of death and rebirth. Other ideas suggested by the image are a kind of self-destruction, or perpetual motion. None of these interpretations were considered invalid. The theme’s real purpose is simply to spark the imagination. “Who are you going to make the game with?” people asked. I didn’t know that, either. In fact, I came in to this Jam a stranger, but I knew I would meet like-minded people who had come to create. This year, I participated at Harrisburg University in Pennsylvania. The room was a mixture of students, teachers, professional developers, and game enthusiasts. We started the evening by mingling, then listening to the keynote speeches recorded specifically for Game Jam by developers around the world. For 2012, there were actually four keynotes recorded: Will Wright, Baiyon, Gonzalo Frasca, and a joint keynote with Brenda Garno Brathwaite and John Romero, all of which can be viewed on the Global Game Jam site now that the event is over. Following the keynote, each site may have an individual key note or tech demos as well. At Harrisburg, local studio LightHammer showed us the basics of the UDK game development interface. After a break for dinner, we then learned the theme, and got to work. In the first few minutes, everyone generated as many ideas as they could. Over the course of the night, ideas were slowly whittled down by interest and feasibility, and production began. Participants can create electronic games or board games, though everyone at our site chose a video game this year. I’ve done the jam either as a participant or supervisor for the last four years. So the experience has taught me a few different things. First is something perhaps better-said by Ian Schreiber, one of the global organizers, on his Twitter feed. It helps to have experience in the jam environment before. Going in, I at least knew what to expect, which helped toward getting a game that felt somewhat-finished after 48 hours. That ties in to another important idea: scope. It’s difficult to create a big interactive 3D environment in that time, or a game that relies on a long, extensive backstory. A larger team could create a larger game, but larger teams also rely on a lot of communication and can be less agile, so there is a downside to that approach. However, it is a good place to iterate a small part of a large idea, and I’ve seen teams continue to work on their games at the end of the jam. Prototyping and playtesting are huge. The team that most at our site felt did the best job overall, was also the team that had a working prototype of the game as early as the first night. That gave them plenty of time to figure out if the game was fun yet, and to continue to iterate and polish the graphics. Another thing I had learned from previous Jams was that I would probably want to sleep just a little. Two whole days can seem like a very long time. Thinking ahead, I brought an air mattress. Not thinking ahead, I didn’t bring extra batteries for the mattress’s inflation gizmo, and I ended up spending the first night on the floor anyway until I could go out and forage for energy. To be honest, the thing I always want the most after 48 hours is a shower, followed by healthy food, followed by sleep. These are pretty much arranged in order of how difficult it is to get them if you don’t occasionally go home; you’ll sleep anywhere if you’re tired enough, but a shower is pretty specific. Some jammers do go home, which is the best idea if you are an adult and live close to the site. I like to think of myself as an adult, but the jam site was an hour from my apartment and driving on little sleep is difficult. So the mattress was a good idea… in theory. I’ll talk a little about the game my team made. It wasn’t the original idea that our group came up with, but we determined that a game with the kind of scope we thought of initially, probably wouldn’t be doable by our small team in the limited time. We had someone in the group who knew GameMaker, and I for one have been wanting to learn it, so I liked the idea of giving it a try. I’ve seen games using GameMaker get good results in a jam environment, because it works fast. As it turns out, I spent most of the weekend in Photoshop, but I still got some exposure to the software. From our original idea we ended up creating a run-and-jump game inspired pretty heavily by Canabalt and similar small platforming titles. It isn’t entirely bug-free, but it was a playable game, fun to make, and a good test of our team’s skills. Every once in a while, there’s a game from the jam that captures the interest of the gaming press and gets a big chunk of coverage. At the Nordic Game Jam, Petri Purho’s 4 Minutes and 33 Seconds of Uniqueness captured lots of interest for its creativity. 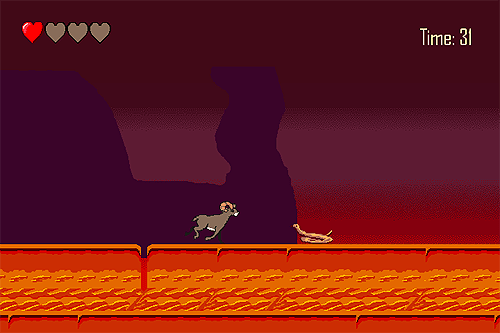 GNILLEY, made at Game Jam Sydney in 2010, was popularly celebrated as a fun Zelda send-up with a very unique control scheme. More recently, last December’s Ludum Dare got a lot of press coverage when Minecraft’s Markus Persson, AKA Notch, participated and made the web-based Minicraft. But, often, we don’t hear much about jam-created games in the game news. I think that’s because… it’s not just about the games. For most of us, this event is about the process. It’s about the idea of getting together with people, old friends or new, and making something together. About the excitement and stress of quick iteration and collaboration. And maybe you’ll have a great game to share, too. For another take on the jam at the Harrisburg site, visit Andy’s blog, from LightHammer. To play some games, made quickly, but with love, just go to GlobalGameJam.org and check out what it has to offer! IndieGames.com also has a slightly curated collection, if you want to look at some favorites. I’d like to thank everyone at the Harrisburg site, everyone at all the other sites, and the global organizers for a great event! This is awesome. I’ve never actually participated in the Global Game Jam, but it seems like it’d be a lot of fun. 244 events in 48 nations? How amazing is that? Applying the pressure of “get a working game in 48 hours” is really a wonderful opportunity for aspiring developers. The structure of the event makes it impossible to lose focus, and helps ensure discipline among the team. Some really remarkable games have come from these things. Glad you finally got some sleep, Amanda! Yeah, I took Monday as a recovery day. It is very fun. I know the old group back in Detroit had a good time also. Thanks for this Amanda, very insightful and hugely inspirational. Before university me and a friend — a coder — were going to start making small games (this was before the indie boom so we didn’t have a name for them!) but whenever we exchanged ideas he was quick to dismiss many of them — some of which have appeared over the years since in some way or another. It’s disheartening because at the time I was so full of fire but his lack of enthusiasm for almost everything really dowsed those flames. I didn’t really have a clue about these game jams but they sound fantastic to me. I love the idea of mixing with like minded people, throwing ideas around and trying to come up with something together. 48 hours though! Wow! I keep meaning to have a look at Game Maker because some of my favourite indie games have been made using it (Spelunky, Immortal Defense, The Oil Blue, Death Worm). Seems that Dustforce was made with it as well so it’s a very capable application. Gregg, things are changing. last year Anna Anthropy railed against changes in the Game Maker pricing strategy. That fire you lost, incidentally, is pretty hard to rekindle. However, this article just made me go and take another look at Construct, a solid alternative to Game Maker that I’ve been keeping an eye on since it launched, and it seems to be going from strength to strength. I think Jonas Kyratzes did a bit in Construct, although he had his issues with it. I don’t think he’s been using it recently though. Eh, I think if someone is interested in making a small game, it’s better that person try out the tool first for their own platform, and worry later about compatibility. Otherwise you’d just go around in circles about what tech to use and never get anything done. At least if you’re not programming the whole thing from scratch in C++, or something. …oh hey, someone ported Spelunky like six months ago!